Sometimes you just want to throw everything in a pan and hope it comes out amazing. Today, we'll show you how the right arrangement and timing can make that happen. 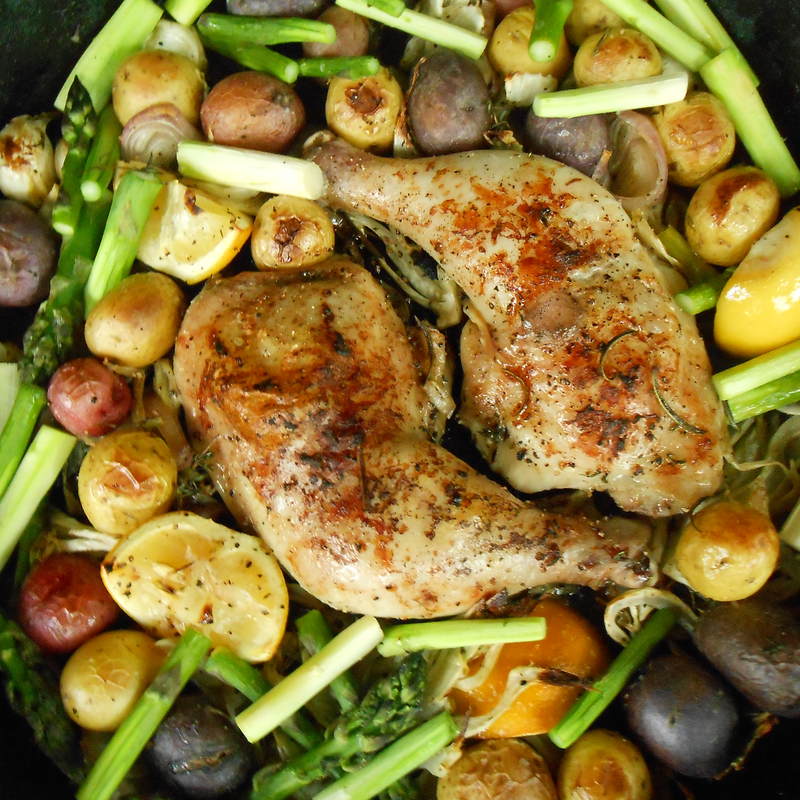 Roast chicken is one of the most versatile, crowd-friendly meals. As far as flavoring, we never understood "lemon pepper" seasoning. It smells weird. Plus, lemons are cheap and keep in your fridge for like, two weeks. Try to choose asparagus that are firm and have tightly closed purple-ish tips. Fresh herbs work beautifully here, but you can use dried if you forgot to pick them up. Warning: your kitchen is going to smell like you want to lick the air. 1. Preheat oven to 350 degrees. Throw the skillet in the oven while it heats up. 2. When oven and skillet are hot, toss fennel, potatoes, garlic, shallot, lemon, rosemary, and thyme with canola oil, 1 tsp. salt, and 1/2 teaspoon black pepper in mixing bowl. Add to skillet. Push to edges of skillet to clear a space in the middle for chicken. Season chicken all over with 2 teaspoons salt and 1/2 teaspoon pepper and arrange skin-side up in the middle of the pan. 3. Transfer skillet to oven and roast until fennel has begun to soften, about 20 minutes. 4. Stir vegetables so they cook evenly. Try to keep them in a single layer. Return to oven and roast another 10 minutes. 4. Baste chicken with pan juices. Add asparagus and sprinkle with remaining 1/2 teaspoon salt. Return to oven and roast until vegetables are easily pierced with a knife and the juices from the chicken run clear, about 15 minutes. 5. Slide skillet under broiler. Broil on high until chicken skin is browned and crispy, about 2 minutes. Serve immediately.